MOSCOW (AP) So much for this being a ”World” Cup. Africa and Central America didn’t make it past the group phase. Oceania and the Caribbean couldn’t even earn an invite. ”What we’re seeing here for the most part, when it comes to that European and South American talent, it’s in abundance, and it’s traditionally very successful,” said former American defender Alexi Lalas, at the World Cup as a Fox analyst. Since the current format of group stage followed by knockout rounds started in 1986, 46 of 72 quarterfinalists have been from Europe and 18 from South America, with Wednesday’s England-Colombia match to decide another spot. CONCACAF has made it three times: Mexico at home in `86, the United States at South Korea in 2002 and Costa Rica in Brazil four years ago. There has been just one from Asia – South Korea, when it hosted the tournament. That Korean team was the only outsider that advanced to a semifinal, where it lost to Germany. Teams from other continents approach matches against world powers trailing before the opening kickoff because of a mentality deficit. They often speak after losses lamenting they gave opponents ”too much respect.” They approach World Cup games as if facing an entire nation, not just the 11 opponents on the field. That us-against-history affliction has proven difficult to treat. ”In Italy, I think some of the fans said if they don’t beat the U.S. 4-0, it’s a disgrace,” 1990 U.S. captain Michael Windischmann said when the Americans returned to the World Cup after a 40-year absence. 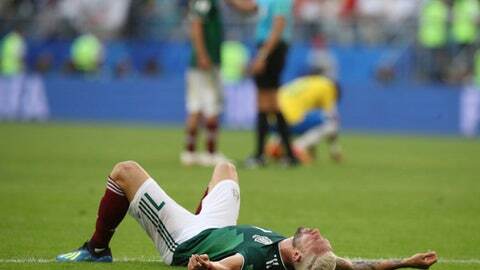 Mexico is the North American power, yet it has lost seven straight round-of-16 matches and been frustrated in its national quest to reach ”el quinto partido” – the fifth match – for the first time since `86. The quarterfinals are all European and South American for the fourth time in nine World Cups, after 1994, `98 and `06. Only once has more than one outsider made the last eight, when CONCACAF, Africa and Asia each advanced a team in South Korea. Lalas thinks Africa is the most likely nation to break the powers’ hegemony.